How the MyPlate Calorie Tracker Can Help You Eat Better - Now With Free Meal Plans! Did you know that over 10 million people have found out how to eat to fuel their minds and bodies and lost a collective total of 41 million pounds (that is, 20,000 tons or 100 times the weight of the Statue of Liberty) with LIVESTRONG’s MyPlate Food and Fitness Tracker? MyPlate is the best way to find out if you're eating the right foods to meet your goals, and it’s currently available for iPhone, iPad, Apple Watch and Android phones. Not sure what to eat? The all-new 8-Week Stronger Meal Plans and daily workout videos give you healthy snacks, meals and recipe suggestions — all designed to get you great fitness results. We have omnivore, vegetarian, vegan and gluten-free plans — all free. Plus, you can get a weekly grocery shopping list, so that you will have all the needed ingredients. Here's how you sign up -- it's easy! Here are 4 ways our Stronger Program will make this year your fittest yet. Do you know how much protein you should be eating at each meal to stay feeling full? This is where your macronutrients -- or macros -- are essential to pay attention to. The average adult woman is advised to consume 50-75 grams of protein per day, and more if she’s very active. Men are generally advised to consume more because they have a higher muscle mass on their bodies to maintain. Consuming protein at around 25-30% of your daily calories has been shown to boost your metabolism by up to 80 to 100 extra calories burned per day, compared to lower protein diets. This is because eating protein boosts your metabolic rate and reduces your appetite. It also helps you build and preserve your muscle mass which helps you to burn more calories around the clock. MyPlate takes the grunt work out of the weight-loss process by determining your caloric needs using your age, height, current weight, fitness goal and activity level, and tabulating your daily intake goal for you. MyPlate will also show you how much protein, fat and carbs you should be eating. The daily snapshot of protein, carbs and fat grams and percentages allows you to easily monitor your macros and caloric intake to reach your goals -- whether it's fitness goals, energy or mental clarity. Easy-to-read charts give you a quick summary of your progress over time, including calories eaten, weight lost, and how many carbs, protein, and fats you're eating. Looking for motivation and advice? Thousands of members with similar health and fitness goals use our active community message boards with knowledgeable moderators to provide each other with support and advice, swap recipes and tips, and even share a laugh. The free LIVESTRONG MyPlate calorie tracker app for iPhone and Android has helped millions of people lose weight the healthy way -- by getting support from an active community as they track their eating and exercise. 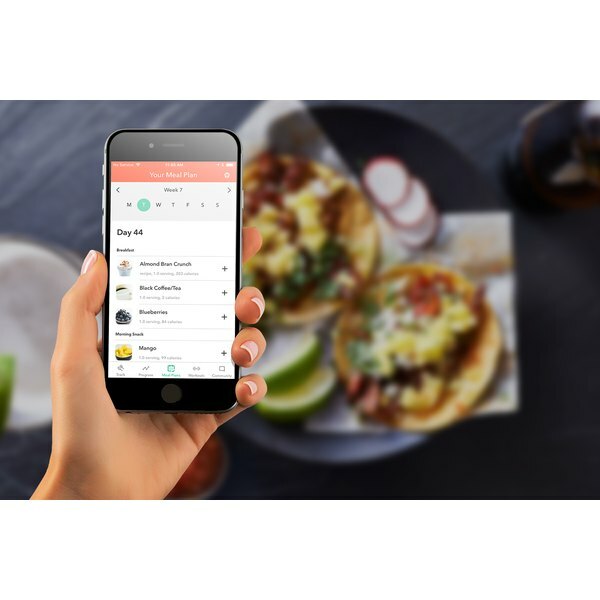 Consistently a top-rated app, MyPlate offers the latest technology in an easy-to-use tool that includes millions of foods, 5-minute in-app workouts, and a robust support community. LIVESTRONG's MyPlate app has a database with over two million foods, enabling us to understand our users’ eating behavior and provide them with actionable tips and takeways that will help them be more conscious and in control of their health. All the while, we also educate our readers about the impact and the hidden risk of dangerous ingredients in processed foods and pesticides in non-organic versions of their most commonly consumed staple crops such as coffee, apples, corn and grapes. Our aim is to help and inspire people worldwide to live happier, healthier, fitter and longer. JESS BARRON is VP & GM for LIVESTRONG.COM, a leading healthy lifestyle website with over 32 million unique monthly viewers. In addition to LIVESTRONG, her writing has appeared in Entrepreneur, Fortune and MyDomaine. Jess has appeared on MSNBC and ABC News and has been a keynote speaker at Health Further and a panelist at SXSW, Create & Cultivate and Digital Hollywood. Follow Jess on Instagram at @jessbeegood and Twitter too! How Many Calories Are You Supposed to Have Daily?